By Julie Moir Messervy. Photos by JMMDS, except where noted. 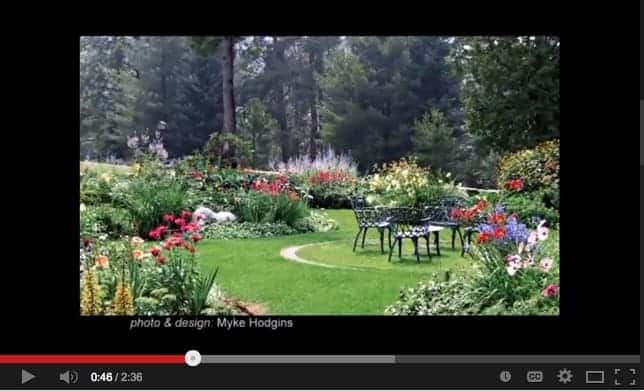 Thanks to JMMDS’s new book, Landscaping Ideas That Work, 2014 has been a whirlwind of activity for this author. Nearly every week or weekend since January, I’ve been on the road giving talks about LITW and other topics and I’ve had a wonderful time doing it. One reason that I’m particularly proud of this book is because my design team at JMMDS was involved in all aspects of its creation, from the call for submissions to the writing to the layout, graphic design, and illustrations. It’s a beautiful book full of inspirational ideas, tips, before-and-afters, case studies, and helpful information, so if you haven’t bought it yet, please do. January 25th: Latchis Theater, Brattleboro, VT: LITW lecture with fellow speakers Dan Snow, Gordon Hayward, and Helen O’Donnell. 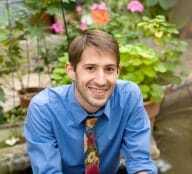 January 27th: New Jersey ASLA, Atlantic City, NJ: Home Outside lecture. At the New Jersey ASLA Annual Meeting, I met with students from the Rutgers landscape architecture program to answer questions and share my experiences as a landscape designer. Julie with Rutgers landscape architecture students. 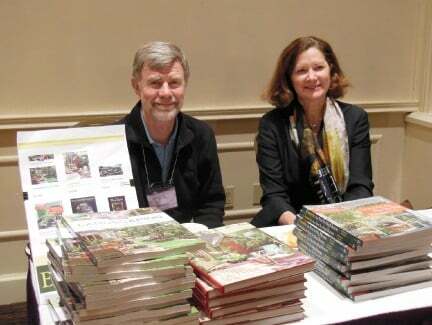 My husband, Steve Jonas, came to my New Jersey lecture and helped me sell books. It’s always wonderful to travel with him. Steve and Julie at the ASLA Annual Meeting. 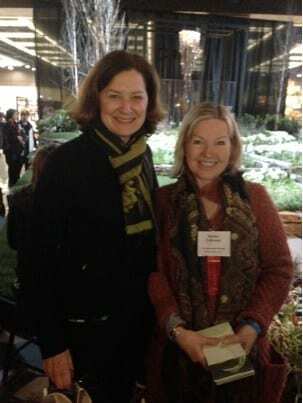 February 2-7: Northwest Flower & Garden Show, Seattle, WA: Judging, LITW and Home Outside lectures. Opening Night at the Northwest Flower & Garden Show. Show owner Terry O’Laughlin (far left) with members of his excellent staff. My friend and colleague Debra Prinzing brought together a talented group of garden writers, designers, and horticulturists to meet me during my stay in Seattle. What a marvelous group of women! 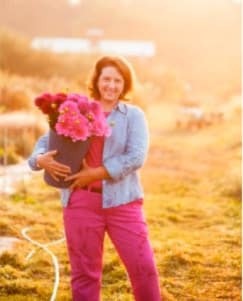 Debra Prinzing photographed at Jello Mold Farm in Skagit Valley, Washington. © Mary Grace Long. 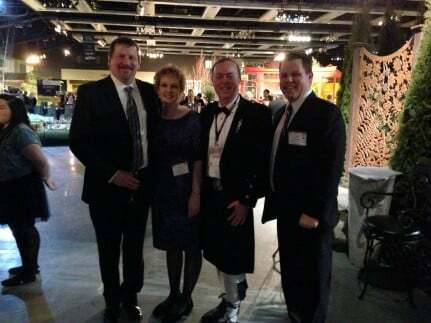 Judging the NW Flower and Garden Show with my fellow judges Duncan Brine and Doug Justice was a lot of fun. 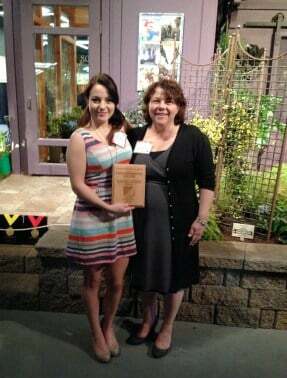 The Art of Retreat was a winning design by a talented mother/daughter team, Courtney and Sue Goetz. Courtney Goetz (left) is only 18 years old! 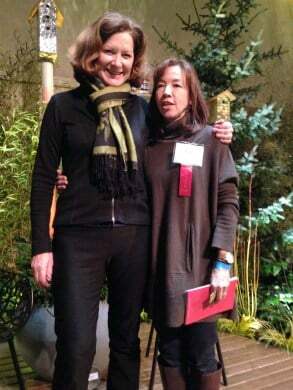 Another winner, Lisa Bauer of Chartreuse Landscape, employed fanciful hand-made birdhouses that provided vertical foci to an elegant garden. 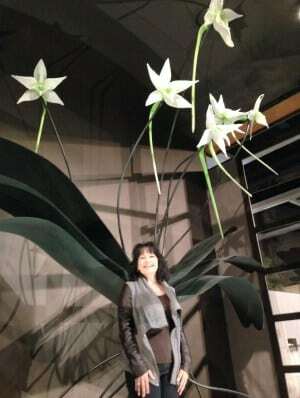 Designer Karen Stefonick of Karen Stefonick Design created Darwin’s Muse: Art Imitating Life, an elegant garden and glass conservatory that housed “Darwin’s Orchid”—a glass sculpture by artist Jason Gamrath. Susan Calhoun of Plantswoman Design designed a long central rill surrounded by birch trees that stood out for its symmetry and simplicity. 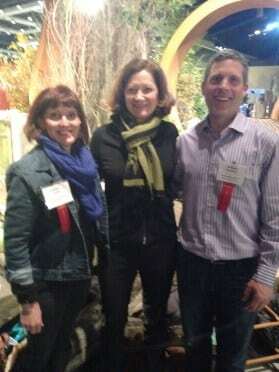 Best in Show was a remarkable garden by Kirsten Lints of Gardens Alive Design and Robert Boyker of Avid Landscape. Kirsten Lints, Julie, and David Boyker. February 11-13th: Lewis Ginter Botanical Garden, Richmond, VA: Design charrette, The New Homestead and The Art of Plant Placement lectures. Claudia West was my fellow speaker along with Dan Benarcik at the Lewis Ginter 2014 Winter Symposium. Her talk was about color in the landscape, but from a whole new point of view. 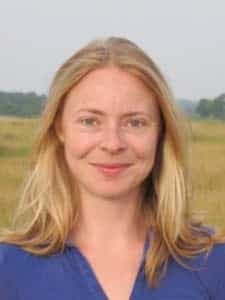 She delicately and eloquently talks both the science and the aesthetics behind the way we look at the natural landscape. Wonderful! 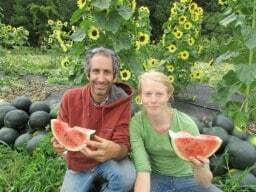 At the 2014 Gardeners Connect Symposium, I loved getting to know Joseph Tychonievich, who has a wonderful blog called Greensparrow Gardens. He presented about the science behind not using pesticides. Terrific speaker!! Joseph Tychonievich. Photo: Plant Xing. Matthew Goldfarb and Petra Page-Mann. Photo: Fruition Seeds. The new launch of our Home Outside Palette app is close to being finished! We will be bringing it out with improved features for iPhone/iPad users, but now also for Android and desktop users at last! We and our developers, Brisk Mobile from Toronto, have worked hard to improve its usability, and we’ll be including in-app purchases that offer a range of useful tools and many new plant types. We’re hoping it will be out at the end of March or early April, just in time for you to use it to design your garden! Spring is almost here, but there’s still time to use our online landscape design service to help you plan or make changes to your property. Get in touch!